Zach to the Rescue, a Lavallette woman forthcoming book. Before Superstorm Sandy struck, Karen Sandy (the name is simply a coincidence) was neither a dog owner nor a writer. 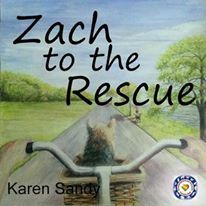 Now, after years of recovery and hard work – she’s both, with her first title, “Zach to the Rescue,” about to be released. Sandy, a resident of West Point Island in Lavallette, has been a resident of town for about 15 years. Her kids are now adults, and life was good before the storm struck. But as with many local residents, seeing the destruction first-hand – the sight of all her neighbors’ furniture lined up at the side of the road for pickup is still a haunting memory – led to some angst. “My husband had a hard time after the storm, readjusting,” she told Shorebeat. In was in that period, Sandy said, when her son told her he had seen a news report about dogs being helpful in lifting one’s spirits after a trauma, so she and her husband decided to take a trip to the Associated Humane Society shelter in Forked River to adopt a dog. Unfortunately, the dog passed away a short time later, but the couple had fallen in love with dog ownership, and adopted another dog, Zach, from the Humane Society’s shelter in Tinton Falls. Zach, who immediately became a beloved member of the family, also lost his home around the time Sandy struck. “When we stopped at the Tinton Falls facility, he was at the front desk instead of a cage like the other dogs were because he was a nervous wreck,” she said. The small dog, a silky terrier, had been found by a sailor near Naval Weapons Station Earle under a pile of leaves. “When we first got him, he couldn’t even walk up the stairs,” Sandy recalled. Zach became an inspiration for a book, Sandy said, when she was thinking about a lesson she learned as a child: that when you’re feeling down, helping someone else can make you feel better. In this case, helping Zach get back on his paws and in a loving home helped heal the wounds from the hurricane. “I’ve always loved children’s books, and I got the idea to write a story,” Sandy said. Set on the bay in a small seashore town like Lavallette, the book teaches children about the importance of helping others. After Sandy wrote the book, she turned to the Ocean County Artists’ Guild to find an illustrator. Kevin Hebborn, an artist from the badly-damaged neighborhood in Toms River near Cattus Island County Park, spent a year working on the colorful drawings that made the book come alive. A publishing company based in Brick, Hibernian Publishing, agreed to print it. Sandy said all of the proceeds of the book will be donated to the Associated Humane Societies to help animals in need. It will soon be for sale on Amazon.com and in local shops. Sandy will appear at a meet-and-greet June 16 at Lavallette Pizza from 7-9 p.m.
As for Zach, he’s happy as ever.